Limes, the green-skinned, less-acidic cousin of lemons, are a year-round grocery staple. Bright-green Persian limes are the most widely-sold variety, and their tart, lively flavor is a summertime favorite. This isn’t surprising, considering lime is an essential ingredient in the warm-weather cuisines of Southeast Asia, Latin America and the Pacific Islands. Just like lemons, this popular fruit can be used many different ways. Lime juice and peel add refreshing tartness to a variety of dishes, sweet and savory. Like salt, lime juice can also enhance the flavors of other foods. Ready for the limelight? Because with lime’s flavor-brightening powers, you’re sure to attract attention. Add a splash of lime juice to marinades for grilling, or mix it into BBQ sauce for a Caribbean kick. Squeezing fresh lime juice over skillet-cooked seafood adds instant island flavor. (Visual learner? Watch our Baja Fish Taco video!) And don’t overlook desserts: Think zippy cream pies, summery squares and even cookies! For tropical flavor and beautiful color, tuck grated lime zest into cheesecake batter, or float lime slices in sangrias and punches. Select firm, plump limes that are heavy for their size. Lime peels should be brightly-colored, smooth and glossy. Small brown patches on the skin do not affect quality. Refrigerate limes in a plastic food storage bag for up to two weeks. Wrap cut limes tightly in plastic wrap and refrigerate for up to three days. Scrub limes thoroughly in warm, soapy water to remove surface wax and traces of insecticides. This is especially important if the peel will be used. To remove the peel, use a box-shaped grater, a special citrus-zesting tool or a vegetable peeler. Make sure not to remove the bitter white pith underneath the peel. 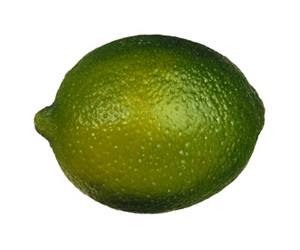 To extract the most juice: Bring limes to room temperature or warm them in a microwave on HIGH for 15 seconds. Roll the limes firmly on a counter to break up the juice sacs, then cut limes crosswise into halves and use a reamer or juicer to extract the juice. Add a splash of lime juice to marinades for extra flavor. This works well for grilled meats, poultry and seafood. Toss freshly cut apples, bananas, pears and avocados with lime juice to prevent them from browning. For an easy breakfast, brunch or dessert, squeeze fresh lime juice over melon, summer berries or tropical fruit, like mango and papaya. Add a burst of citrus flavor to hot, cooked rice by stirring in grated lime peel just before serving. Brighten the taste of creamy salads by adding a touch of grated lime peel to KRAFT Mayo Real Mayonnaise before tossing with salad ingredients. Stir a bit of grated lime peel into your favorite plain PHILADELPHIA Cream Cheese cheesecake batter for an instant taste of the tropics.